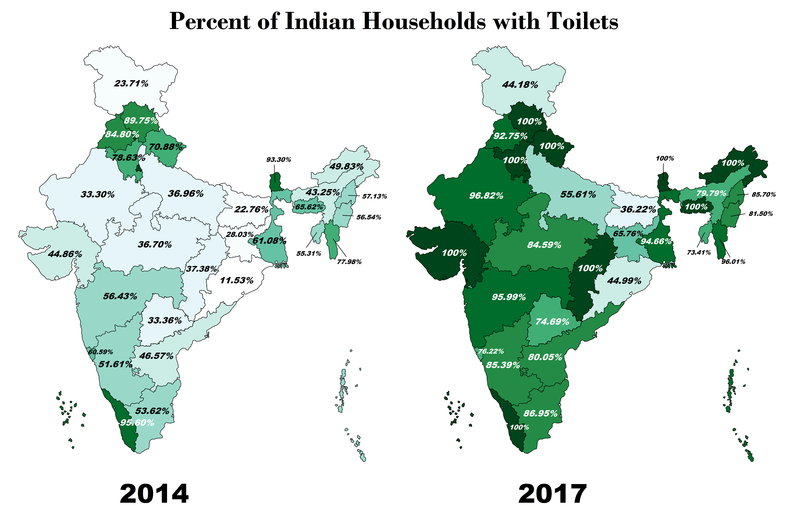 The map above shows the theoretical change in the percentage of Indian Households with their own toilets between 2014 and 2017. On October 2, 2014, Prime Minister Narendra Modi launched the Swachh Bharat (Clean India) Mission, a massive campaign to clean up the country’s cities, towns and rural areas. One of the key objectives of the Mission is to eliminate open defecation by launching an educational and promotional campaign, constructing household-owned and community-owned toilets and establishing a mechanism to monitor their use. The aim is to achieve an open-defecation free India by October 2, 2019, the 150th anniversary of the birth of Mahatma Gandhi. The Mission has two components: an urban program under the Ministry of Housing and Urban Affairs and a rural program under the Ministry of Drinking Water and Sanitation. The urban component includes the construction of household, community and public toilets, upgrades to existing toilets, improvements to solid waste management and a public awareness campaign. The core target of the rural program is the construction of 111.1 million toilets at a projected cost of US$30 billion. The Mission has a workforce of around 3 million, including government employees and school and college students from all parts of India. The primary task of constructing toilets is done either by the individuals with funding help from the government or, in some cases (mostly for public toilets), by the government itself. According to the Ministry of Housing and Urban Affairs, as of the end of 2017, the urban component has seen the construction of over 4 million individual toilets and 234,000 community and public toilets and has declared 1,678 cities to be free of open defecation. (For the latest data on the urban program can be seen here. However, as of January 2018 there had been no independent verification of the numbers, which had caused the World Bank to delay the release of a $1.5 billion loan for the rural program. According to the media, some of the reported results may have been overstated. For example, a recent posting by the Business Standard provided an analysis of budgetary allocations that suggested that some states may have inflated the number of toilets constructed under the program. This last point highlights the fact that the challenge is not only one of constructing enough toilets, but also one of overcoming cultural barriers to their use. Although much still needs to be done and significant challenges remain, nevertheless it appears that considerable progress has been made in many parts of India in addressing this serious public health issue. Are teacher likes your websites and your founder.